Why I Love Chemical Peels! I have hyper-pigmentation around the outside of my face, textured skin, and discoloration. I feel like the dark spots got worse while I was pregnant and never really went away. Plus, I've been getting random bumps and I wanted to give my face a reset. I am almost 40 ya'll, and the cold months always make me feel kind of blah! The peel appointment is much like that of a facial. You lay back, your skin gets cleansed, and our esthetician applies a series of products onto your face. There is a tingle and burning feeling for a few short minutes, but she fans your face so there is little discomfort. Before you know it, she'll apply some moisturizers, sunscreen, and it’s all done. I left looking shiny, but not red or irritated. In fact, I looked great for about 24 hours because my skin was tighter than normal. My skin felt a little tight for a few days after the treatment and I started peeling within 48 hours. Shedding is a bit gross at times, but it really didn’t bother me at all. It is hard not to pick, but picking is a big no-no! Even though I am shedding, I'm not staying locked in my house. I'm wearing tinted sunscreen, mascara, and I'm doing me. This picture is day four of shedding and honestly, I don't feel beautiful, but it is fine! I see the fresh healthy skin peaking through the scaly skin. I have hope that my new glowy skin will be here soon! I don't have a good before picture, but I'll post an after picture in about a week. 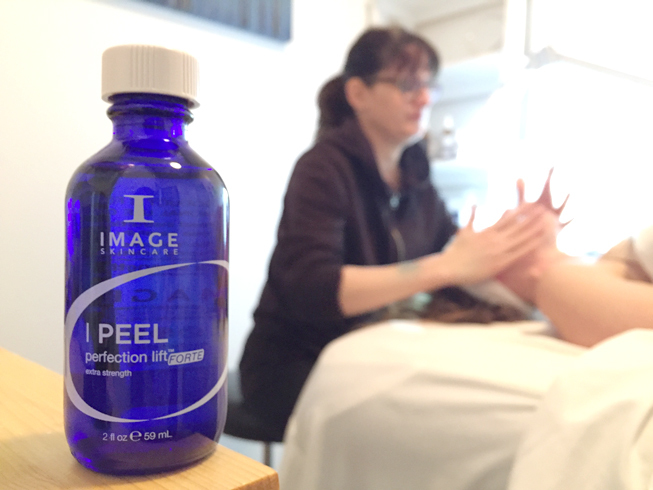 Image Skincare recommends for best results, a series of 6-8 peels at 2-4 week intervals. We can help you decide which program works best for you and your skin conditions. We are currently offer $20 OFF Clinical Strength Peels with Heather in November & December. You can check out her schedule here. I am already planning my next peel in about a month. Are you going to try one? Just FYI: A chemical peel is a chemical exfoliation process that penetrates deeper in the skin in order for the top layers of the skin to start shedding. This process stimulates collagen and increases cellular turnover to reveal new, fresh skin. We offer two kinds of peels, light and clinical strength. Light peels are great for organic exfoliating, acne, and brightening pigmentation, but you don't actually peel ($15 OFF light peels Nov-Dec). But for the results I was desiring I went for the clinical strength peel, and I am peeling! Always use warm water on your face and do not scrub. Avoid chlorine. amount of visual flaking is not indicative of your end results. If heavier shedding is present do not under any circumstances pick or manually peel the skin. You must take precautions to avoid sun exposure in order to protect your skin as well as to get the full benefit of the peel. Peels increase your skin’s sensitivity to the sun and particularly the possibility of sunburn. Exposure to UV rays can cause hyper-pigmentation, freckling and sun damage. We recommend that you stay indoors as much as possible and use sunscreen. Do not use any glycolic, retinol, or Retinol-A for 5-7 days or until your skin is back to normal.You'll simply cleanse and hydrate with our organic skin care. Lastly, we love IMAGE Skincare because a lot of their products contain organic ingredients, and they use plant based key ingredients. The extra strength peel is a concentrated blend of active exfoliants to effectively reduce the appearance of advanced aging, pigmentation and acne. This treatment reveals a younger you in a single treatment.